It is suitable for testing compression springs, tension springs, torsion springs clutch plate , leaf springs, rubber mounts, and diaphragm springs. This machine is most suitable for both company owned workshops and private Leaf Spring Service centers. It can easily bend all vehicles leaf springs currently available in the market .The extra power compared to other machines will help in doing continuous jobs and completing the jobs faster. This is the highest selling model in Powerman range. These machines are exclusively manufactured for the Indian railways for testing the Coil and Leaf springs that are used in the Coaches. - 1. Induce failure in case of defect. - 2. 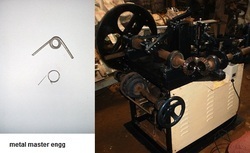 All springs have a setting length, This process is done to bring the spring to the final setting length. Springs for load rate as per IS:1135-1984. - Measuring ranges available with auto load selection facility. - Large size table for wide range of springs with motorized rapid adjustment of test height. RHS – 10 : It is another high speed Segment based compression coiling machine with Spring manufacturing Capacity extending up to 200 pcs / minute. Automatic mattresses spring making machine. 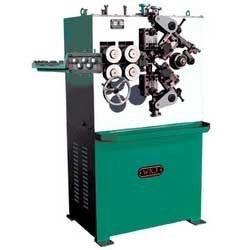 We are offering spring testing machine that are used for coil, helical and laminated springs. These are manufactured using latest technology to ensure long working life and outstanding performance. - Spring Torsion Testing Machine is used for torsion test for spring or any elastic material.